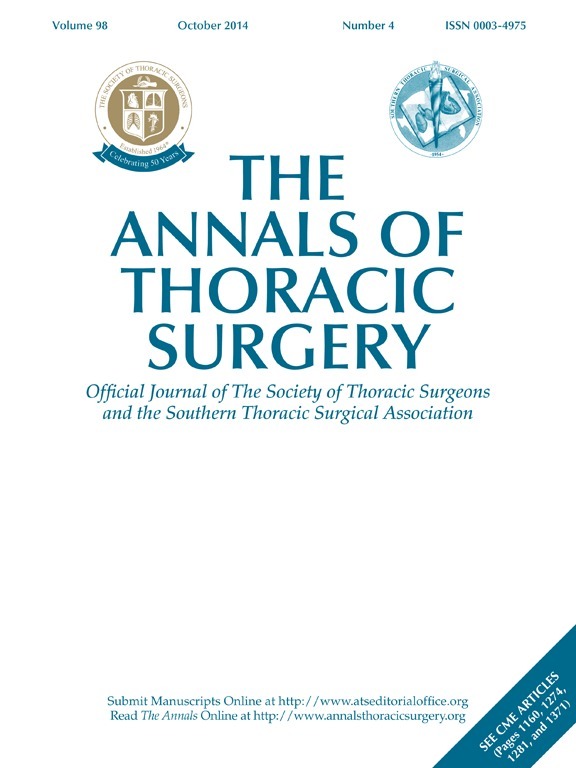 The Annals of Thoracic Surgery is the official journal of the Southern Thoracic Surgical Association and The Society of Thoracic Surgeons, two of the largest American associations in its specialty. First published in 1965, The Annals is an international, peer-reviewed journal that provides outstanding original coverage of recent progress in adult and congenital cardiovascular and chest surgery and related fields. This leading monthly receives over 3,000 manuscripts for consideration annually and maintains rigorous acceptance standards under the editorial leadership of Editor G. Alexander Patterson, MD, and a distinguished editorial board. The journal’s current impact factor, an important journal metric published by Thomson Reuters each year, is 3.849 and Thomson Reuters’ Journal Citation Reports ranks The Annals as 16th of 198 surgery journals, 32nd of 123 cardiac and cardiovascular journals, and 13th of 50 respiratory journals. An authoritative, clinically oriented, comprehensive resource, The Annals is committed to providing a place for all cardiothoracic surgeons to relate experiences which will help improve patient care. Submit a manuscript to The Annals. View the current issue of The Annals and reference archives.